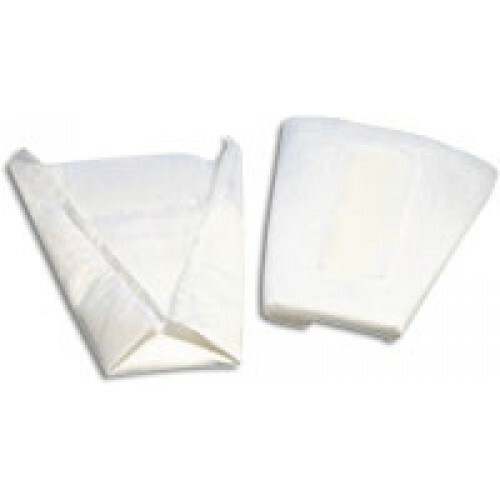 Manhood Absorbent Pouches, by Coloplast, are designed for light or moderate incontinence. This Penile Pouch is composed of a super absorbent polymer. This incontinence pouch can hold up to 250 cc of urine. How do they work. Do they go in your briefs? They can be used to tuck into your briefs. We have several absorption pads available. For best results, search for "incontinence just for men" in our search bar. I'm Mr. Nolan's (sp) daughter. We are pleased with the results. Do you supply the gov't with this product? If so, can you give me info to reach the POC for that Client, my father is a WWII Vet and we initially used a box given to us from a veteran, and have not been able to locate the stock number to re-stock thru the gov't thus far. Excellent product, convenient, comfortable, discrete and useful. I have small inconsistency. But the thing is that it wasn't so easy to find absorbent pouch for me. Most of them were for more serious patients. This mentor male absorbent pouch was perfect for me. It stays always dry so you don't have any unpleasant feeling.